The Burrowing Snagret is a boss present in all three games. Some particular types of enemies are larger or stronger than the other, more common ones, but appear less frequently. These are known as bosses, and normally only one or two of each type appear in the entire game. Given that battles against them are usually more complex, the rewards tend to be better, such as a large number of Pikmin seeds, Pokos, or an important story-related item. Through each game in the series, the definition of a "boss" has become progressively clearer. In Pikmin the game seldom makes a distinction between a boss and a regular enemy. In Pikmin 2, bosses are given different slots on the Piklopedia and a specific musical theme, with some even having unique ones. 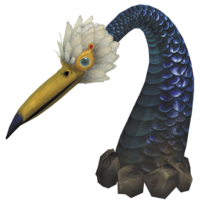 In Pikmin 3, bosses are clearly identified as such by the game itself, and are divided between main boss and mini-boss, even having unique cutscenes and musical themes. They need to be defeated to progress with the story. Hey! Pikmin also has bosses with unique cutscenes and music, and defeating them is also necessary to advance to the next sector. Oddly, Candypop Buds, geysers, and Iridescent Flint Beetles are technically bosses, though this is likely due to their unique nature as enemies. As a result, approaching a Candypop Bud or a geyser will change the music to the enemy battle variant. Three other enemies are often considered mini-bosses by fans due to their rare appearances and boss-like level of difficulty, even though there is nothing in the game that technically distinguishes them. There are no mini-bosses in this game, though the Burrowing Snagret and Emperor Bulblax have literal mini variations with lower HP, which appear in places where they aren't fought as final bosses of a cave. The Empress Bulblax also has a lesser variation with lower HP and fewer attacks than the "primary" version. Late in the game, earlier bosses are sometimes rebattled and act as mini-bosses of a cave, such as in the Hole of Heroes. Additionally, the Fiery Bulblax, which may have originally been intended as a boss, could be considered a mini-boss by fans, as it is a relatively difficult enemy. The Calcified Crushblat, Peckish Aristocrab, and Spotty Bulbear are sometimes considered mini-bosses by fans due to their difficulty and rare appearances, but they do not have the mini-boss theme. When fighting bosses, the music of the area or cave is changed to a different theme that lasts for as long as all bosses in the vicinity are alive. In Pikmin, this is only the case for the Beady Long Legs and the Emperor Bulblax, with each one having their own theme. In Pikmin 2, a global boss theme exists, and plays whenever a living boss is nearby. This theme changes dynamically with the events happening in the fight. The following bosses have their own specific boss themes: Waterwraith, Giant Breadbug, and Titan Dweevil. In Pikmin 3, two boss themes exist – one for the major bosses and another for the mini-bosses. The exceptions to this are the Vehemoth Phosbat and the Plasm Wraith, which have their own themes. The mini-boss theme is a remastered version of the Pikmin 2 boss music. This article was a featured article from February 1st, 2018 to April 2nd, 2018. This page was last edited on November 23, 2018, at 13:15.